May 18, 2016 By Allyson 4 Comments This post may contain affiliate links. Read my disclosure policy. 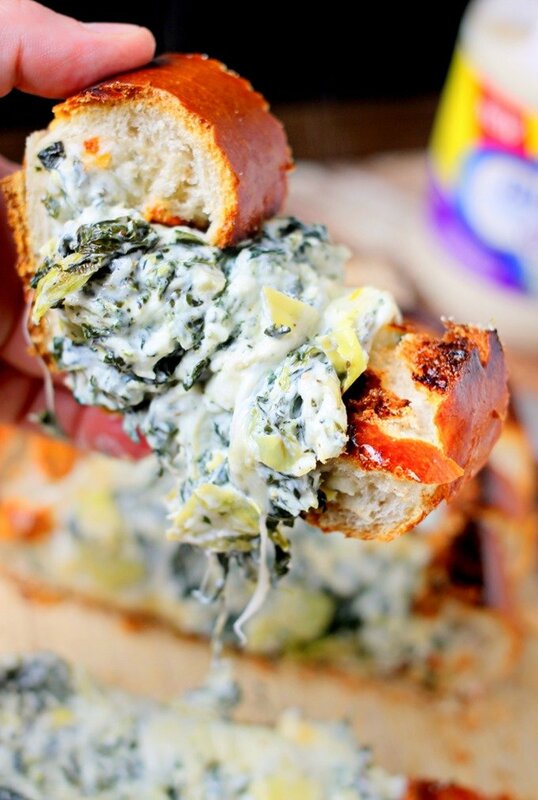 This one of a kind Stuffed Spinach & Artichoke Cheese Bread is taken to the next level by using one secret ingredient – Blue Plate® Light Mayonnaise with Greek Yogurt, which adds a little tang and a creaminess that can’t be matched! Blue Plate was kind enough to sponsor this post, and I can’t wait to share this with you! Cook this up and everyone will swoon over this easy recipe! 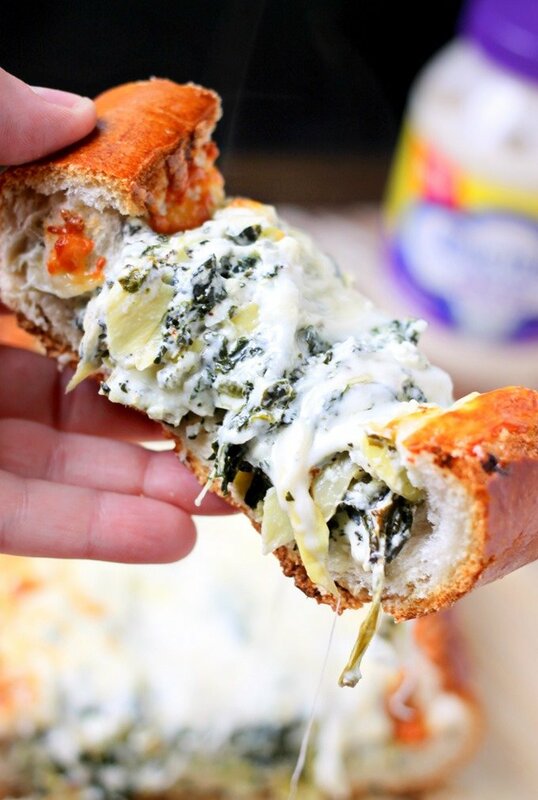 I’ve been making variations of this stuffed cheesy bread for a long, long time. It’s a HUGE crowd pleaser, and everyone is constantly asking me for the recipe. 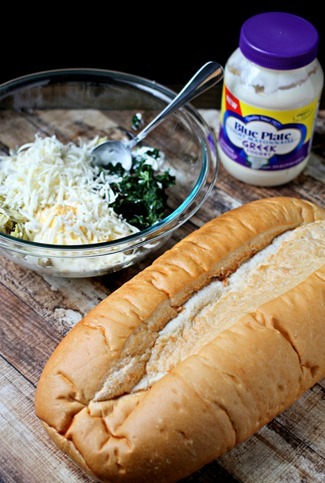 When I heard about Blue Plate® Light Mayonnaise with Greek Yogurt, I knew using it in place of full fat mayo in this recipe, would be a hit. It has half the fat of regular mayo, but you won’t miss it because of its creamy, tangy flavor that enhances the flavor of this bread. It really takes it to the next level! I also LOVE this recipe because it’s so easy to make! With only a handful of ingredients it comes together super quickly, and then it only takes a short bit to cook. I always make this when we have people over, and everyone always loves it. it’s really simple, and using the new mayo with Greek yogurt, you are adding protein and a little tang that can’t be matched. 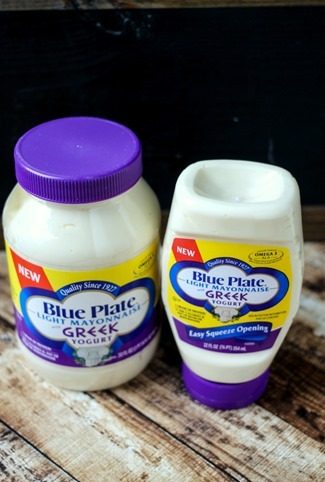 You know, Blue Plate Light Greek is the only mayo that offers a Greek yogurt variety – totally cool! I also like making this ahead of time, wrapping it up, and then baking when we get places. If you are going to a potluck and need to make something the night before, just whip this up and then cover. Bring it when needed and then bake when you get there! 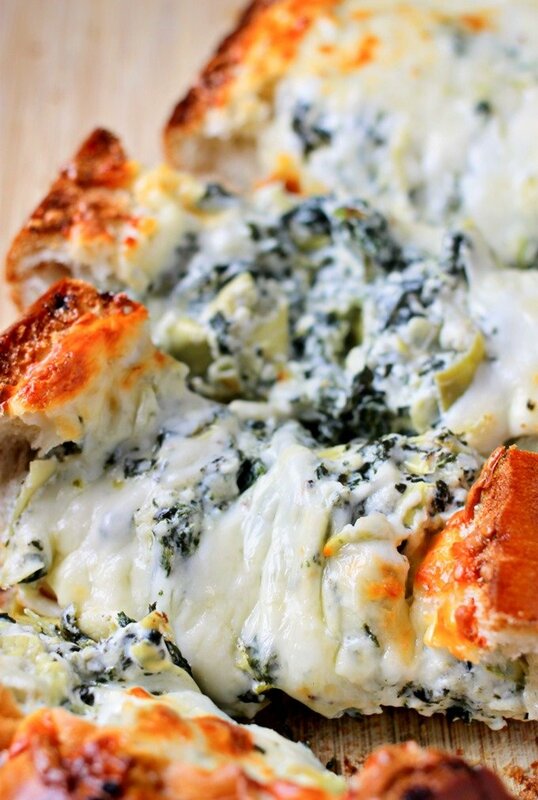 In a large bowl, combine spinach, artichoke hearts, Blue Plate® Light Mayonnaise with Greek Yogurt, sour cream, 1/2 cup cheese, garlic powder, salt, and black pepper; mix well. Cut into your French bread, making a hole to put your dip. Careful not to cut through the bottom. Spoon dip into the hole, and spread around evenly. Top with remaining cheese. Use foil to cover the bread loosely, you do not want the foil touching the bread or else it will rip off the cheat - tent loosely. Cook for 20 minutes, covered, then remove foil and bake for 5-8 more minutes or until bread and cheese are browning. Remove from oven. Using a serrated knife, cut into slices and serve immediately. Optional: Melt butter and mix some garlic with it. 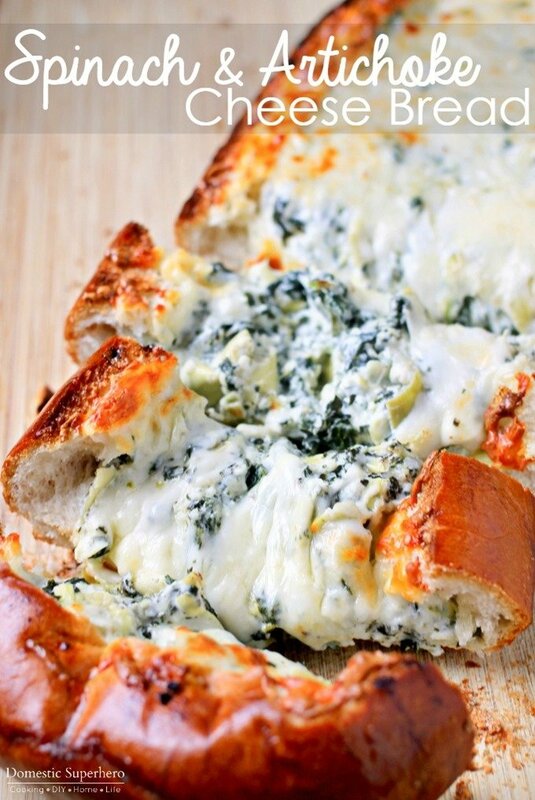 Brush over sides of bread to make a delicious garlic butter crust. Need more recipe ideas for this delicious new product? I was lucky enough to receive 3 Recipes by James Beard winning Chef Alon Shaya of Shaya restaurant in New Orleans, but you can also find some on their website! This is a sponsored post written by me on behalf of Blue Plate® Mayonnaise.